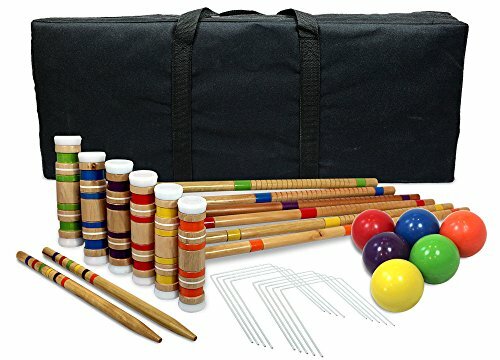 Driveway Games Portable Outdoor Croquet Set includes everything you need for 6-player croquet: 6 wood croquet mallets, 6 croquet balls, 9 wickets, 2 wood stakes. Our mallets and stakes crafted from hardwood for durability. Rubber mallet caps for added protection. Vinyl-coated wickets for scratch resistance. Polymer croquette balls will last for years! Our hardwood croquet set is like the backyard croquette set you played with as a kid, except the portable croquette mallets come apart for compact storage. With complete set packed in the included carrying case, it measures just 27.4 x 9.8 x 7.6 inches. Excellent for closets! Bring your croquet set with you to your next event or family outing and add a unique touch of fun. A classic lawn croquet game for all ages and ability levels. Perfect for family gathering, picnics, parties and more. PREMIUM MATERIALS - Mallets and stakes crafted from hardwood for durability. Rubber mallet caps for added protection. Vinyl-coated wickets for scratch resistance. Polymer croquette balls will last for years! PORTABLE & COMPACT - Like the backyard croquette set you played with as a kid, except the portable croquette mallets come apart for compact storage. Measures just 27.4 x 9.8 x 7.6 inches packed in carrying case (included). Excellent for closets! MEASUREMENTS - Mallet handles 26", mallets heads 8", stakes 18", wickets 8" x 6", and polymer balls 3.3" (and weigh 7.5oz each) Complete set weighs 12 lbs.